Born in Chicago on August 28th, 1926, Beverly Schmidt grew up in the Logan Square neighborhood, near Fullerton and Crawford (now Pulaski Avenue), and her family later moved to Highland Park. Beverly's introduction to dance and theatricality took place at the Embassy Theater, where she and her sister Gloria saw many double features starring Fred Astaire and Ginger Rogers, as well as live Vaudeville performers. Bev and her mother Florence went together for dance lessons at Arnwahl Studios, which led to Beverly's first public performance, in a spectacle at Soldier Field featuring hundreds of dancing children. Beverly's dance education continued as a young adult in the midwest with Nancy Hauser, Sybil Shearer and others. 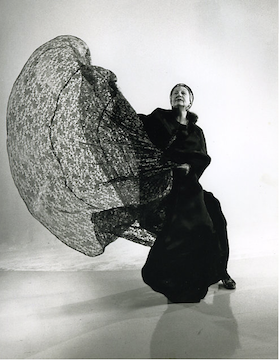 After seeing a Martha Graham performance, she made the decision to move to New York and seriously pursue a career in modern dance. While studying dance in New York City with Hanya Holm, a young Beverly Schmidt met Holm protege Alwin Nikolais, who had begun teaching and choreographing at the Henry Street Settlement. In 1953, Beverly became a principal performer in his fledgling dance company, remaining with Nikolais Dance Theatre as they skyrocketed to world renown, touring globally and performing on television. During this time, she earned a master’s degree in dance from Sarah Lawrence College, under the direction of Bessie Schonberg. On a Fulbright scholarship in 1957, she studied in Berlin with the legendary Mary Wigman. Beverly’s career as a choreographer and solo performer began during her Nikolais years and continued after she left the company in 1963. During this period, she originated many works including her famous Black Traveler, performed completely on a stool to cartoon music. As Dance Curator at the Bridge Theater on St. Marks Place, she was involved in a number of influential performances, including seminal “Filmstage” collaborations with actor-poet-writer Roberts Blossom, who would eventually become her husband. In 1967, after the birth of her only child, Michael, Beverly Blossom accepted a position on the faculty of the Department of Dance at the University of Illinois at Urbana-Champaign, an established program with state-of-the-art facilities in the new Krannert Center for the Performing Arts. Here she developed her unique style of group choreography, integrating Nikolais’ dramatic but impersonal use of lighting and costume with her own, more personal style, including storytelling and the influence of Vaudeville. She toured with group pieces during this period, while continuing to refine her solo work, creating Dad’s Ties and Besame Mucho, which would become her signature pieces. She retired from the University in 1990, but as Professor Emerita, she returned several times to perform, teach master classes and reconstruct group works. Two events were dedicated to Beverly's memory in November, 2015: A one-night gala performance in New York, featuring many dancers performing her choreography, along with two panel discussions about her life and legacy. 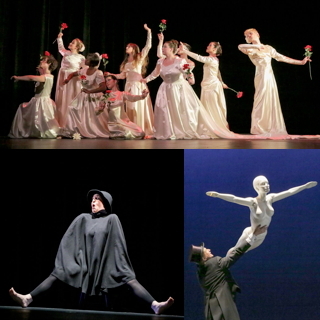 And at the University of Illinois, the fall dance concert, dedicated to her, featured the reconstruction of Brides with a larger cast, and two exhibits of her costumes, photos, videos and artifacts. Now her son Michael, along with four longtime colleagues of Beverly’s, have launched the Beverly Blossom Foundation with a broad mission of sustaining her legacy in ways that contribute to the field of dance. Beverly left behind a rich archive of materials related to her long career—and the careers of many other important artists—and BBF’s first project is to begin the process of identifying, cataloging and digitizing these materials. Donate to support this important work, and to allow Beverly’s unique artistic point of view to enrich future generations.